So much right, and yet, so much wrong. Oh, hey, this has been sitting in Chrome waiting for me to hit POST for like five days. Neat. On what was, overall, a pretty successful show, the WWE earned a lot of credit by making history, then spent that credit by how they made it. TJP, Jack Gallagher, and Drew Gulak vs. The Lucha Connection (Kickoff): I’m going to give it tot heLuchadors. Revival vs. Gallows and Anderson (Kickoff): Revival gets their win back. Booby Roode In An Open Challenge Totally Against Dolph Ziggler (Kickoff)I: If for some reason its not Ziggler, then Roode will win. AJ Styles vs. Kevin Owens and Sami Zayn (Handicap, WWE CHamp): AJ wins this. Rollins and Jordan vs. The Bar (Raw Tag Champs): The Bar getting the belts anyway. Brock Lesnar vs. Braun Strowman vs. Kane (Universal Champ): Kane is in this match to eat the pin from Lesnar. Women’s Royal Rumble Match: But I bet it’ll be Asuka. 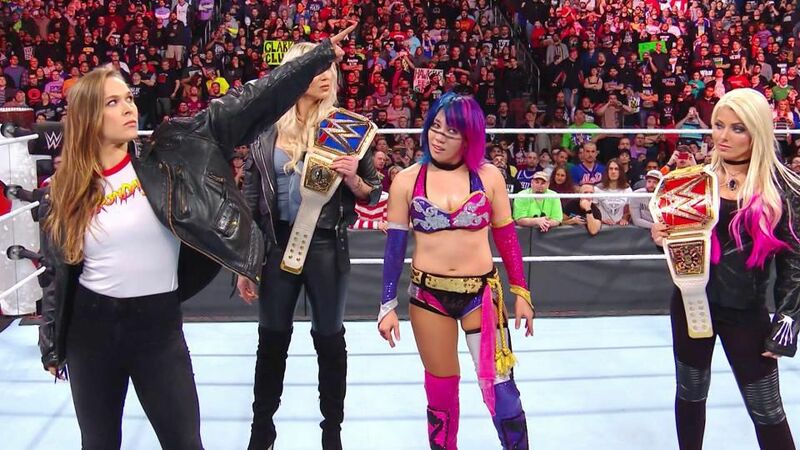 Yep, Asuka won the first ever women’s Royal Rumble. You wouldn’t necessarily know it based on the match booking, where she only eliminated two people - one from NXT and one no longer on the roster. Michelle McCool, by contrast, eliminated four people, three of whom are on the active roster (technically - one was Lana). And you wouldn’t know it from the post-match celebration, where, instead of picking which champion she would go up against, she got upstaged by Ronda Rousey walking around slowly and pointing a lot.